Long terminal repeat retrotransposons represent a major component of plant genomes and act as drivers of genome evolution and diversity. Musa is an important fruit crop and also used as a starchy vegetable in many countries. BAC sequence analysis by dot plot was employed to investigate the LTR retrotransposons from Musa genomes. Fifty intact LTR retrotransposons from selected Musa BACs were identified by dot plot analysis and further BLASTN searches retrieved 153 intact copies, 61 truncated and a great number of partial copies/remnants from GenBank database. LARD-like elements were also identified with several copies dispersed among the Musa genotypes. The predominant elements were the LTR retrotransposons Copia and Gypsy, while Caulimoviridae (pararetrovirus) were rare in the Musa genome. 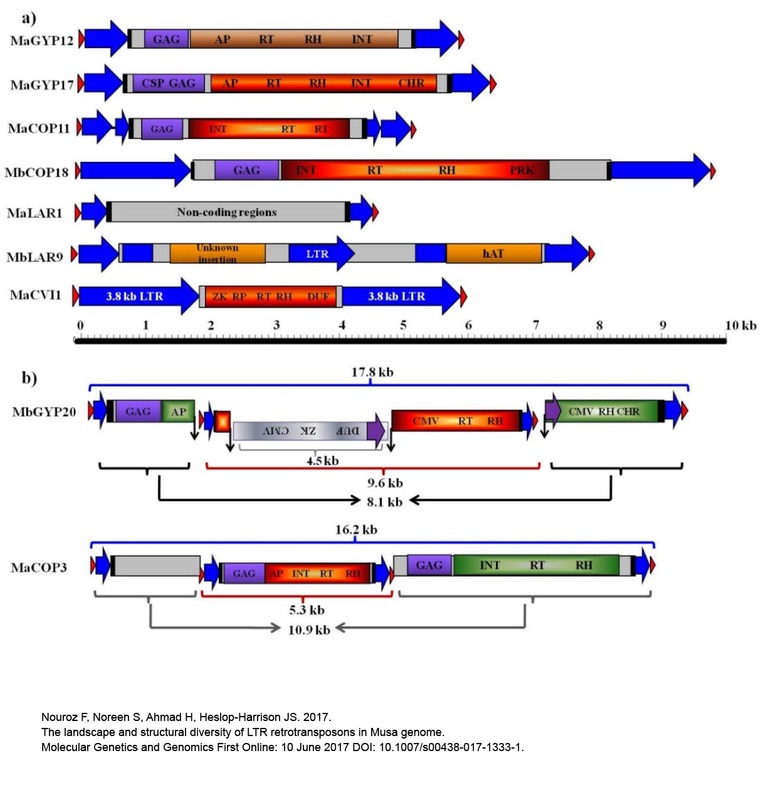 PCR amplification of reverse transcriptase (RT) sequences revealed their abundance in almost all tested Musa accessions and their ancient nature before the divergence of Musa species. The phylogenetic analysis based on RT sequences of Musa and other retrotransposons clustered them into Gypsy, Caulimoviridae and Copia lineages. Most of the Musa related elements clustered in their respective groups, while some grouped with other elements indicating homologous sequences. The present work will be helpful to understand the LTR retrotransposons landscape, giving a complete picture of the nature of the elements, their structural features, annotation and evolutionary dynamics in the Musa genome. Keywords: Musa, retrotransposons, Copia, Gypsy, Biodiversity, phylogeny, genomics, evolution. This entry was posted in Musa, Publications, Species and tagged bac, banana, bioinformatics, breeding, genomics, LARD elements, LTR, musa, retrotransposons, sequencing. Bookmark the permalink.